We’re here in (surprisingly warm) Vienna over Christmas, and today, my friend and I had the pleasure of visiting Café Sacher (Philharmonikerstrasse 4, 1010 Wien, Österreich), famous as the place where the Sacher Torte, named after the Hotel Sacher, was created. We had just come from the Hofburg Palace, where we stood for 2 hours during Christmas Mass with the Vienna Boys Choir, so we were looking for a place to unwind before we headed off to the Schönbrunn Palace in the afternoon. 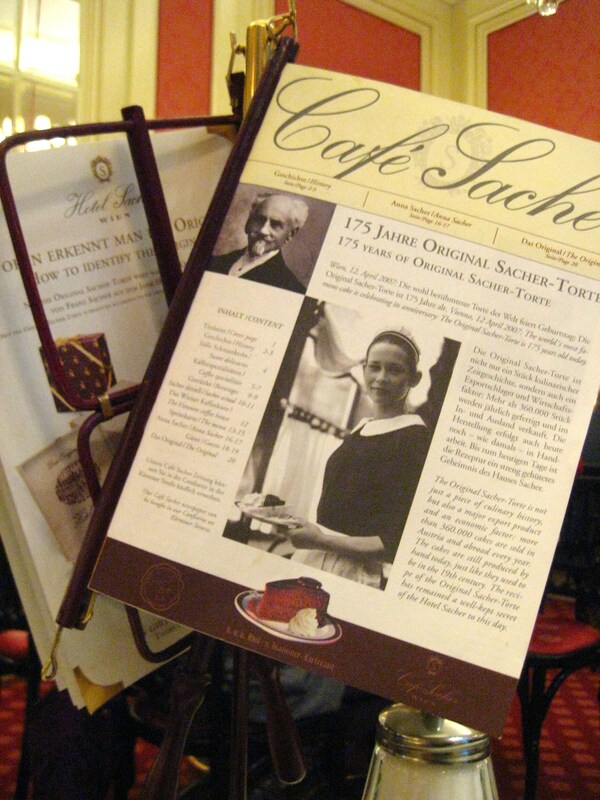 Since we were in Vienna, and near the Albertina anyway, why not stop by Café Sacher? My friend ordered the Sacher Torte, of course, but since I’d already been there before and tried it, I decided to order an Apfelstrudel instead. 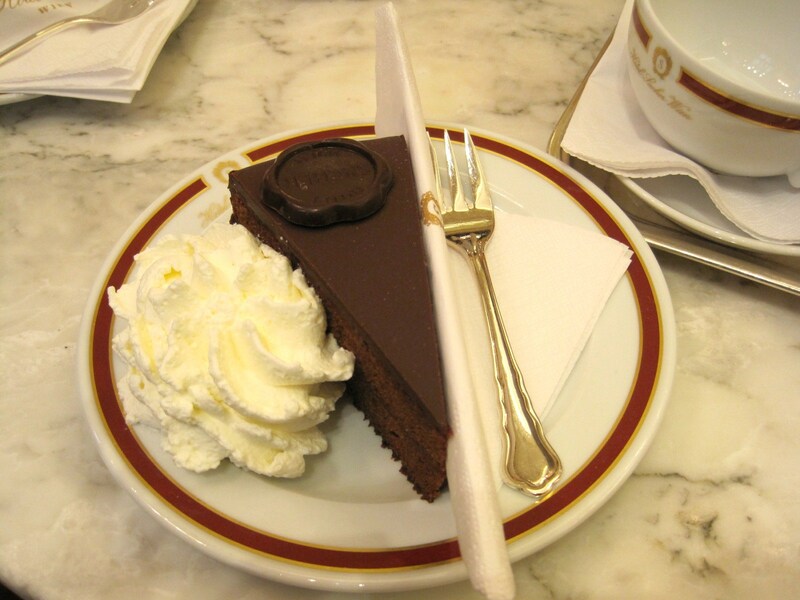 The Sacher Torte was rich, chocolatey, and surprisingly fluffy (except for the chocolate coating, of course). If you love chocolate, you’ll die and go to heaven after eating this – it’s super-rich, but not so sweet that you feel sick after eating half of it. It comes with a generous dollop of whipped cream…mmmm. Photo courtesy of Joanne K.
The Apfelstrudel was tender and quite easy to cut. 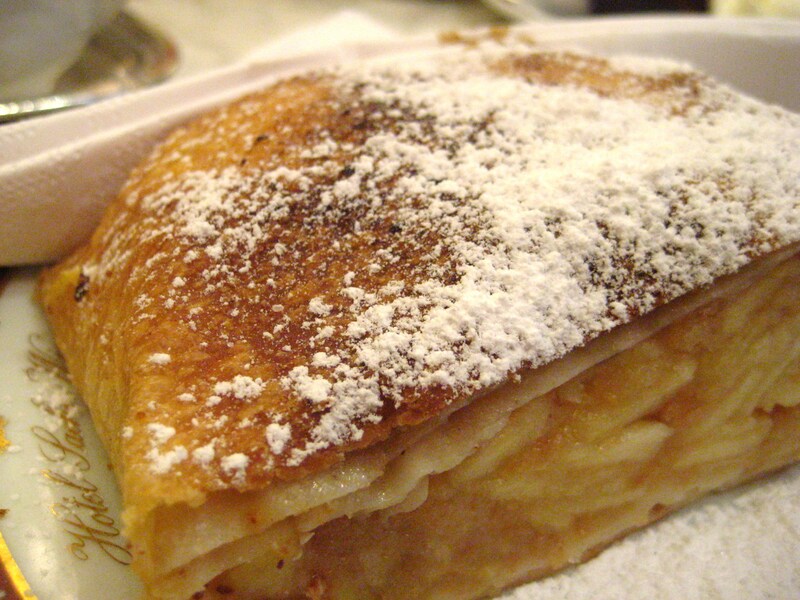 It had apple chunks and raisins, spiced with cinnamon and sugar in usual apfelstrudel fashion with powdered sugar on top. It would’ve been even better heated up, in my opinion, and I hate to say it, but I kind of prefer the crunchy top of the American version…but that’s just personal preference, and Francesco is probably going to have something to say about food being pure and all that. Oh well, sorry, Kookie. 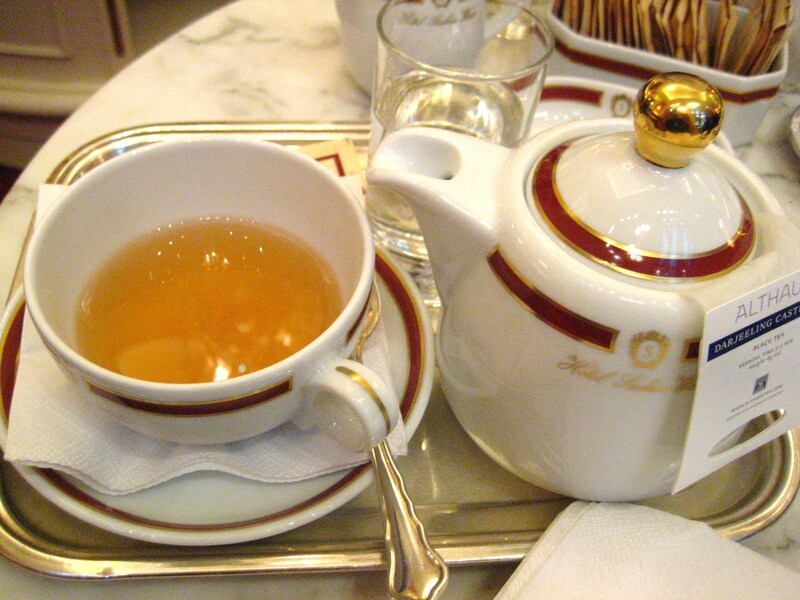 Both of us had tea with our dessert – she had the special Café Sacher blend, and I had a Darjeeling, which is my favourite type of tea. I was going to have a Himbeer Soda, but decided that wasn’t so classy in such a fancy cafe (though I was wearing my UBC sweatshirt and my backpack, so any sense of proper dress was already out the window). Hmm guess you’ll have to return to Cafe Sacher next year 🙂 BTW I plan to give Apfelstrudel a go in January.